The diary is a looking glass. At first it reflects the diarist. Stefan Kanfer, in Introduction to Penguin Book of Diaries. What would a family member have written about a day trip- fifty years ago? As we roamed around in Riverwood , Jack Darling, Rattray Marsh areas of Mississauga, and I showed Hardik and Aarti, the many places where we have read and walked in Riverwood- this question made me think of the many journeys done by different sections of the family over time. The Yellow Trail is different from the Red Trail. Then we walked towards Erindale park and sat on a bench where we have come many times over the years and read-reflected on works of literature. Today, (20.5.18-Sunday) we went through the introductions and some thoughts on the Penguin Book of diaries from our home library. Hardik told of the day he managed to get an interview with a university representative in Churchgate area and how he drove in his Splendour Motorcycle from Bhiwandi. That trip has now evolved into many journeys, and he visited Niagara to see the Sound and Lights on Victoria day. Now he goes to New Jersey to visit his uncle, who once gifted him a tennis racket- and there were some of his colony friends who commented that this was a strange type of badminton racket. Hardik has come a long way from the time he would think of setting up a Gaming company or help his father with the pharmacy. The Manager has to think fast. He could not let his Branch close down in the middle of the day. These places are also part of our Reading journal –Thinking place exercises. What does a particular work of literature or art tell us about humanity? With Appu, who had come from Vasai-Malad, we had discussed Howard Zinn’s- A People’s History of United States and browsed through some pages from Teresa Albuquerque’s- Bassein-The Portuguese Interlude. This Sunday, while walking through Riverwood’s –Yellow Trail, I told Hardik about the last book we discussed in the 2017-2018 year of the Courtney Park Book Club. In the pre-discussion entry of Anthony Doerr’s book-see blog https://wp.me/p5YX3a-mm I felt that some characters like Von Rumpel- the gemologist, who may have not been the main protagonists start developing a stronger voice than Werner or Marie Laure. Then the members give their comments and rating on the books- this is followed by discussions on the characters, plot, genre and what we can get out of this particular work of literature. See blog- for a detailed discussion https://wp.me/p5YX3a-mb on what makes a character like Jack Reacher so durable, can such a character exist, what other types of wars exist. While those many discussions are probably best not made directly public, the discussion did make a setting to explore whether Doerr’s Pulitzer prize winning novel- could fall into a coming of age –Bildungsroman –novel. Maybe I am biased, but I feel that Sunil Gangopadhyaya’s novel –Sei Semay- is definitely a more nuanced historical novel than Doerr’s work. Set against the backdrop of the Bengal Renaissance and the rebellion of 1857, the novel revolves around the lives of great men including reformers like Ishwar Chandra Vidyasagar, Debendranath Tagore and his father Dwarkanath Tagore, and also poets like Michael Madhusudan Dutt. 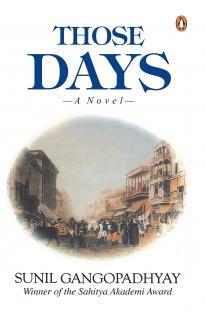 Originally written in Bengali, Those Days was translated by Aruna Chakravarti and combines history with fiction in the perfect manner. Was the Bengal Renaissance the seed-time of nationalistic fervor that culminated in the Swadeshi Movement? Was it more in the nature of an enlightenment? Or was it a form of religious revivalism or Hindu nationalism, the betenoir of the secularists? In Gangopadhyay’s world of the Bengal Renaissance, there are the good Europeans such as David Hare and John Bethune, sympathetic to the Indian cause just as there are bad Englishmen who comprise the bulk of the trading and missionary classes. The many walks in Lodhi gardens-Delhi, where four generations of our family have walked, or the hills and rivers –streams in and around the Rishikesh-Dehradun, or the hill temples in and around Shimla region would be the setting of some day trips of the family- if they had been written fifty years ago. In the case of Buddhdeo family – many nuances of the journey which his father and grandfather took, the family having migrated from Karachi of what was then British India, came alive. The family day trip, through nature trails, opened up many aspects of nature, family, reading journal and our home library. Later, when we returned, I showed them some pictures and relics, the momento given to my Father, on his retirement from Indian Army, after 33 years of service-on April 4,1996, which we have in our living room in Mississauga. These opened up other conversations and many nuances of family histories and associations with different institutions. This entry was posted in Diary and tagged Canada, Mississauga. Bookmark the permalink.